By Madeleine Doubek on Thursday, March 9th, 2017 at 4:27 p.m.
Illinois Gov. 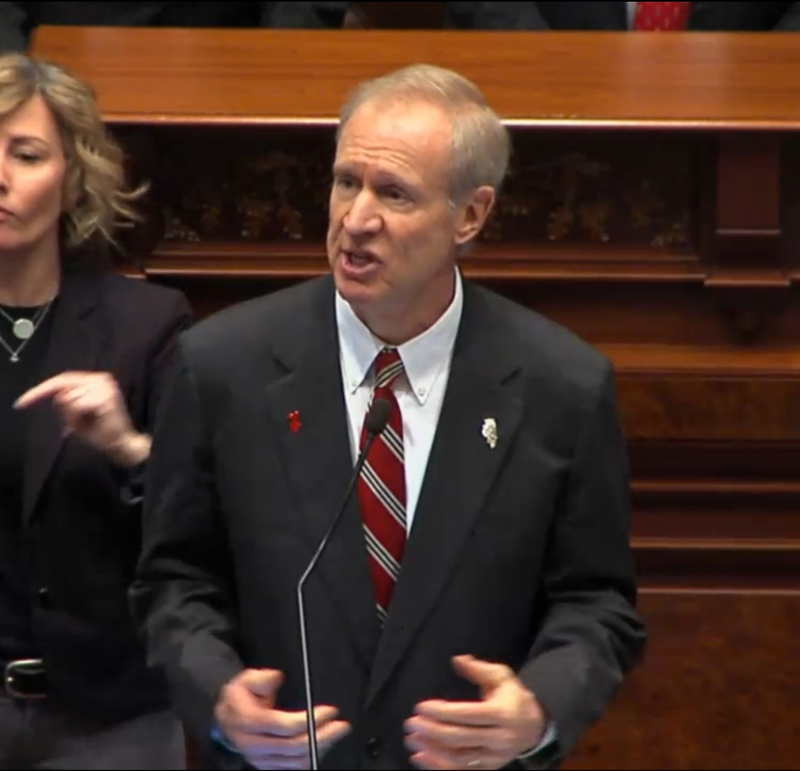 Bruce Rauner speaks to the General Assembly in 2017. In his annual budget speech, Illinois Gov. 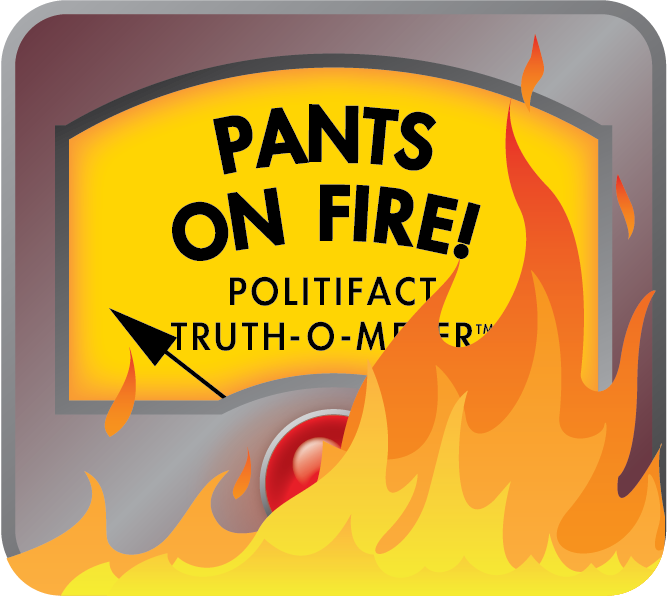 Bruce Rauner said he was presenting a balanced budget. "Today we present you with a balanced budget that shows what is possible if we all come together on a comprehensive approach to state finances and job creation" the governor said. The next morning, his campaign sent an email underscoring that he had offered a balanced budget proposal for the next fiscal year. "Governor Bruce Rauner yesterday outlined a plan to balance the budget that reforms Illinois and builds a new economy," the email read. It included a link to a new, Rauner-funded website, www.budgetandreform.com. The website features a campaign ad that repeats the claim that the governor, who is embroiled in an unprecedented budget stalemate with majority Democrats, has proposed a balanced budget. The ad’s narrator says, "Bruce Rauner's plan to balance the budget reforms Illinois, builds a new economy, freezes property taxes, caps spending, pays down the debt and term limits politicians' power." With so many assertions that Rauner, who has yet to sign a budget into law since his election in 2014, had proposed a balanced revenue and spending plan, we decided to check it out. Article 8, Section 2a of the Illinois Constitution states, "The Governor shall prepare and submit to the General Assembly, at a time prescribed by law, a State budget for the ensuing fiscal year. … Proposed expenditures shall not exceed funds estimated to be available for the fiscal year as shown in the budget." Illinois has not had a full budget enacted into law since 2014. In 2015, Rauner vetoed the budget bills majority Democrats approved, except for the bill that funded pre K-12 education. His 2017 budget proposal is his third since taking office after winning election in his first run for a public position. He previously worked as a highly successful private equity financier. Since his 2017 budget speech last month, Democratic opponents have suggested Rauner’s plan is $4.6 billion to $7 billion out of balance. Page 30 of the budget book released the day of the speech by the governor’s office of management and budget includes a fiscal year 2018 summary page that has a line that says the budget is balanced with $4.57 billion by "working together on a grand bargain." The "grand bargain" refers to efforts by Illinois Senate President John Cullerton, a Chicago Democrat, and Senate Republican Leader Christine Radogno of Lemont to strike a complicated, 12-bill compromise on several major topics that combine new or increased taxes to generate revenue along with business and political reforms aimed at strengthening the state economy and boosting public confidence in government. To date, such a bargain has not come to fruition. The governor’s press office referred questions about the balanced budget claims to Illinois Republican Party spokesman Steven Yaffe. Asked via email to provide the original source for the statement that the governor’s budget proposal was balanced, Yaffe said, "As stated in his budget address, Governor Rauner's plan to balance the budget includes freezing property taxes, capping spending, paying down the debt, and term-limiting career politicians." When asked again for the original source of that statement, Yaffe said, "His plan to balance the budget includes these four items. That's what the advertisement is saying. These four items are keys to passing a bipartisan balanced budget plan in the General Assembly. The final plan is obviously still being negotiated, but these reforms are critical." Despite repeated requests, Yaffe did not offer an original source but said, "The ad is accurate." In his speech, the governor acknowledged he expected Democrats to attack him for not proposing a balanced budget and noted the Legislature’s controlling party has not approved a balanced budget for years. "It’s not going to help us move forward if right after this speech, Democrats run to the media claiming we’ve never proposed a plan to balance the budget," he said. "And it’s not going to help us move forward if Republicans run to the media to point out that the Democratic legislature’s never passed a balanced budget. People want to see us get something done – to get a balanced budget to change our broken system." Chris Mooney, director of the Institute of Government and Public Affairs at the University of Illinois, noted the concept of a balanced budget has been a difficult one for many Illinois governors and legislators over many years. "The word ‘balanced’ seems to have become a politically malleable term. And not just with Rauner," he said, noting former Democratic Govs. Pat Quinn, Rod Blagojevich and others have bent the meaning. "It is in some sense institutionalized and hidden by all the special funds. So does the proposed budget have expenditures equal to revenues in clear, concrete and plausible terms? It doesn’t look like it. "I think the term has been stretched so far by both sides of the aisles and both branches over recent years," Mooney added, that he would "hardly blame" the governor for "playing this ongoing political word game." Ralph Martire, executive director of the Center for Tax and Budget Accountability, a liberal-leaning think tank, didn’t concern himself with rhetoric. "The FY2018 General Fund budget proposed by Governor Rauner cannot be considered balanced by any objective standard for two reasons: first, it relies on over $1 billion in unspecified and unlikely savings from ‘pension reforms’ that are not only unlikely to pass, but if they did, would likely be ruled unconstitutional; second, and even more troubling, is the $4.572 billion in ‘savings’ the governor anticipates from ‘working together on a grand bargain’ -- which is so ambiguous that it cannot credibly be valued at all." Sheila Weinberg, a certified public accountant and the founder of Truth in Accounting, a government finance think tank said, "Our elected officials have been claiming ‘balanced’ budgets for decades, but the state owes more than $187 billion. Mostly likely the governor is not including all of the state’s employee compensation costs in his calculations." Gov. Rauner said he proposed a balanced budget. "Today we present you with a balanced budget that shows what is possible if we all come together on a comprehensive approach to state finances and job creation" the governor told lawmakers. Yet, the budget book produced by the governor’s office of management and budget suggests the budget is balanced by "working together on a grand bargain." A so-called grand bargain budget compromise, though, has not been achieved or enacted. Illinois government finance experts agree Rauner’s proposal is not balanced. Published: Thursday, March 9th, 2017 at 4:27 p.m.